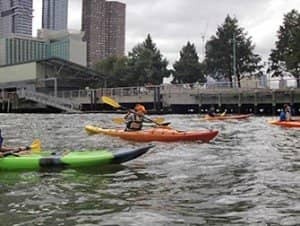 If you like to combine active tours with sightseeing from the water, you can go kayaking on the Hudson in New York. 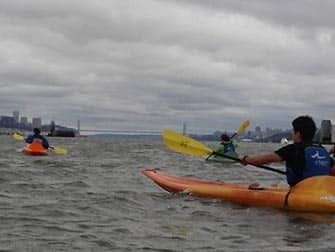 You don’t need any experience before getting into the boat, so don’t hesitate and book this kayak tour on the Hudson! Your tour begins at a boathouse with a ‘beach feel’ on the west side of Manhattan, only a fifteen minute walk from Times Square. You can change and get ready for the upcoming activity. Free lockers are available to safely store your belongings. Everything will get wet in the boat, unless you bring a waterproof camera, it’s better to leave it behind. Bring a set of dry clothes and a towel, to dry yourself and change at the end of the tour. You will be provided a life jacket, after which the guide will explain to you in fifteen minutes what (not) to do. You also get some time to practice in the calm waters around the dock, before you follow the guide towards the Hudson. The start of the tour can be a bit of a challenge, since you have to get used to paddling and you have to sail against the tide straight away. But you’ll get the hang of it! After about half an hour the guide will let you take a short break, to relax and enjoy the unique view of the skyline in peace. The way back is a lot easier, because you go with the flow. And with a bit of luck, the wind will be helping you as well. Eric’s Tip: This tour is particularly suitable for people who enjoying sporting activities. 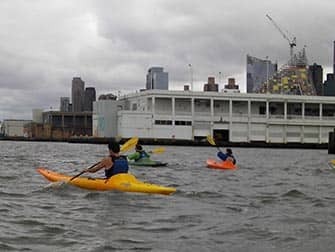 You have a unique view from Manhattan from the water, but first and foremost you are occupied with the kayaking itself. You can book Jet skiing in New York instead.